Attorney-Client Privilege predates US history and is a fixture of Western Law. Pro advocates of its proliferation declare its necessity to a fair and adequate defense. According to many legal experts, NSA monitoring of privileged attorney-client communications stands in direct violation to the United States Bill of Rights and yet others disagree. 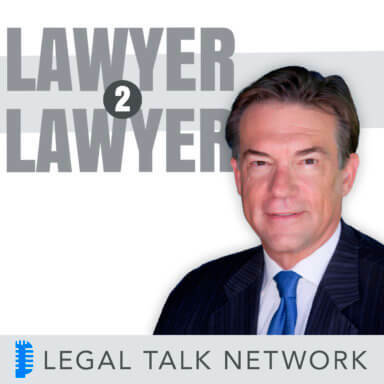 In this episode of Lawyer 2 Lawyer, hosts Bob Ambrogi and J. Craig Williams shed light on this issue with guests Dean Erwin Chemerinsky of the University of California, Irvine School of Law and Dr. John Eastman of Chapman University Fowler School of Law. Erwin Chemerinsky is the founding Dean and Distinguished Professor of Law, and Raymond Pryke Professor of First Amendment Law, at the University of California, Irvine School of Law. His areas of expertise include, but are not limited to, constitutional law, federal practice, and civil rights. Erwin is a renowned author of seven books and nearly 200 articles in top law reviews. He has argued before the nation’s highest courts and has been counsel to detainees in Guantanamo Bay Detention Camp in the Guantanamo Bay Naval Base, Cuba. He is also a regular commentator on legal issues before the national and local media. Dr. John Eastman is the Henry Salvatori Professor of Law & Community Service at Chapman University Fowler School of Law. He was the School’s Dean from June 2007 to January 2010, when he stepped down to pursue a bid for California Attorney General. John is the Founding Director of the Center for Constitutional Jurisprudence, former law clerk for Justice Clarence Thomas, and has served as the Director of Congressional & Public Affairs at the United States Commission on Civil Rights during the Reagan administration. He is also a regular commentator on legal issues before the national and local media.